Fly to Paro, drive to hotel, You will see with your own eyes the legendary splendors of this country. Explore the exotic Sikkim, Bhutan and the Tibetan region – marvel at the ancient Buddhist temples, admire the architecture and get a taste of the magical atmosphere and culture. Afterwards you will be transferred to Paro, Bhutan. Paro is a name for a district, town, river and valley which is one of the most historic valleys in Bhutan. Both trade goods and invading Tibetans came over the pass at the head of the valley, giving Paro the closest cultural connection with Tibet of any Bhutanese district. You will admire Bhutan’s Dzongs – fortresses found in the former and present Buddhist kingdoms of the Himalayas, but most notably in Bhutan. Other amazing sights will include monasteries, valleys and, of course, Buddhist temples. The trip will surely be one you will never forget. Day 01: Kathmandu or From Delhi - Paro by flight: arrival you will be met by guide after clearing customs and immigration you will be met and taken to the hotel. Day 02: Paro-After breakfast, drive to Drukgyel Dzong, a ruined fortress where Bhutanese warriors fought Tibetan invaders centuries ago. The snowy dome of Chomolhari, mountain looms directly over the dzong. Along the way, see the 7th century Kyichu Lhakhang, one of the 108 temples built by Tibetan King Songtsen Gampo. After lunch visit Ta Dzong, originally built as a watch tower, it now houses the National Museum of the Kingdom including antique thankhas, textiles, weapons and armour. Then a visit to Rinpung Dzong whose wooden galleries contain many fine wall paintings. Stop enroute for lunch at Wangdi Phodrang. Gangtey is one of the most beautiful open valleys in Bhutan. Gangtey is the winter heaven to the rare Black Necked Crane which migrates down from the Tibetan Plateau. On a hillock overlooking the small villages is the Gangtey Monastery. This is the only Nyingmapa temple in the country. Overnight at Phuenthshochholing Lodge. This morning leave for Bhumthang stopping enroute at Trongsa for lunch. Later continue on to Bhumthang and on arrival check-in at Wangdichholing Lodge. This is one of the most spectacular valleys in Bhutan and also the heartland of Buddhism. Visit Kurjey, Jamby and Tamshing Lkhakhangs. Also the Jakar Dzong, seat of the district administration. Meals and overnight at the Lodge. After breakfast drive to Trongsa. Tongsa Dzong at an altitude of 2200 m is the most impressive of the Dzongs in Bhutan. Built in 1647by the Shabdrung, it is a master piece of architecture. Overnight at Sherubling Lodge. A five hour drive down the Pele La Pass, crossing the Black Mountains which divide western and central Bhutan. Cross the Nikarchu bridge leaving the Tongsa regions of Central Bhutan. A great white stupa from 18th century built in Nepalese design stands below the road. Stop for lunch at Gangtey or Wangdiphodrang. In Wangdiphodrang visit the Dzong perched on a spur at the confluence of the Sunkosh and Tangmachu rivers. This Dzong was built in 1638. Later arrive Punakha and check-in at Zangtho Pelri hotel. Monring visit Punakha Dzong. Punakha until 1955 served as the capital of Bhutan and still is the winter seat of Je Khenpo, the Chief Abbot. Punakha Dzong was built in the 17th century and is situated at the junction of Pho Chu and Mo Chu rivers. In the afternoon drive to Thimpu. The drive is via Dochula pass (3050 M) which provides a superb view of the highest peaks of Bhutan. On arrival check-in at Motithang hotel or similar. Full day sightseeing of Thimphu valley, visiting Taschihhodzong; the seat of the Government, Chorten Memorial, the Stupa built in the memory of Bhutan’s third King, and then the Handicrafts Emporium displaying rich traditional crafts of the Kingdom, the National Library which has a fascinating collection of ancient Buddhist manuscripts and texts, the Painting School: famous for traditional thankhas paintings and the traditional Medicine Institute where centuries old healing arts are still practiced. After breakfast leave for Phuntsholing visiting enroute Kharbandi Gompa, the beautiful monastery situated at an altitude of 1300 ft, in a garden of tropical plants and flowers. It was founded in 1967 by royal Grandmother, Ashi Phuntsho Choedron. From the monastery garden there is a fascinating view of Phuntsholing town and the surrounding plains. 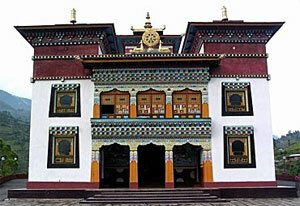 Also visit Zangtho Pelri, a small temple built in the centre of Phuntsholing. Overnight at the hotel. Today you will be driven to Siliguri. Balance of the day free. Overnight at Sinclairs hotel. Today you will be driven to nearby New Jalpaiguri train station to board the "Toy Train" for the 9:00 AM departure on the scenic ride into Darjeeling where you will be met on arrival at approximately 3.00PM and taken to the Windamere hotel. The train runs on narrow gauge thru the mountains and provides superb view of the valley, tea gardens and settlements along the route. Please note: This train is very unpredictable due to track closures and maintainence so if it does not operate the day you are there alternative arrangements will be made to get you to your destination. Nestled in the Himalayas Darjeeling, surrounded by tea plantations, is one of the most popular hill stations of India. Until the beginning of the 18th century, Darjeeling (then called Dorje Ling) was with the rajas of Sikkim. It was invaded by by Gurkhas in 1780 and later by the British after a series of wars. The major development of this pretty hill station took place between 1840 and 1857. In the morning you will have a visit to Tiger Hill, the highest point and Ghoom Monastery In the afternoon you will have a city tour, including the Zoological Park, Himalayan Mountaineering Institute and Museum, Botanical Gardens and the Tibetan Refugees Self Help Centre. Drive from Darjeeling to Gantok, Sikkim crossing the Tista river on the way. On arrival, check-in at Norkhill hotel. Balance of day at leisure. A morning drive through the countryside brings you Rhumtek Monastery which was built as an exact replica of the monastery at Chhofuk in Tibet. In the afternoon you will have a sightseeing tour of Gangtok, the capital of Sikkim including Tsuklakhang, the Royal Chapel of the Chogyals, the Institute of Tibetology whose museum has a vast collection of old tankhas, icons, prized object d’arts and objects used in ritual Tantric worship and the Orchid Sanctuary where many rare varieties of Himalayan orchids are cultivated. Service of the Knowledgeable, Experience & Govt of Sikkim Tourism approved Licensed Guide, tax, parking & all travel related taxes for the tour. International airfares, airport departure fees and taxes, visa fees, meals and sightseeing other than mentioned in the itinerary, services of a personal nature such as telephone calls, laundry etc. or anything else not specifically mentioned as being included.